Orrantia, Erik “The Equinox Convergence”, Etopia Press, 2011.Lambda Winner Proves He Deserves the PrizeAmos LassenI was very lucky to have been one of the first to read Erik Orrantia’s Lambda Literary Award winning novel Normal Miguel and I said to myself then that this guy is going places. Soon afterwards he beat out some very tough competition to win the “Lammie” for gay fiction. I then read his uncorrected proof of a novel due for publication later this year, “Taxi Roja” and I was totally convinced that we have a new and powerful literary star on the rise.I just received “The Equinox Connection” which moves away from gay fiction and moves a bit into fantasy. This is the story of Atua, a young shaman and a member of the Nukui tribe located not far from Acapulco. Her destiny is to become a “curandera” or a shaman for her tribe and follow her father’s footsteps. Of course, shamanism is at odds with the modern world and technology and Atua has not had an easy time and her past is not completely clean. Bennie, a local boy from Carritza, a small village and he and Atua crossed paths. Bennie wants to be like Saul who runs a lab for a local drug lord and the military has been trying to stop his activity. With Atua representing light and Bennie and Tio Che (the drug lord) representing dark, it is inevitable that the two will come together. The balance between light and dark or the equinox is rapidly approaching and each side wants to survive.I feel compelled to say that this is not the kind of book that I usually read but I love Orrantia’s writing and so I decided to give it a try. I learned a great deal and while I am not sure that this genre will become regular on my reading list, I thoroughly enjoyed this. Orrantia has a way with characters and his prose is beautifully thought out. I think also that this book shows the writer’s diversity and it is not a fluke that he won a major award.I believe that we shall be hearing a great deal more about him and if, by chance, we don’t, he is going to have to answer to me. The Equinox Convergence is Erik Orrantia’s second book and follows on the heels of his Lambda Literary Award winning novel Normal Miguel. 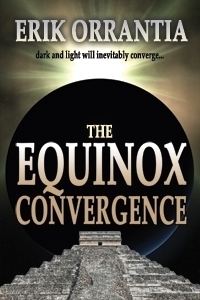 The seasonal equinox – a balance between equal parts of light and darkness – serves as the metaphor for this incredibly gripping mystery suspense thriller that delves into the human capacity for both good and evil and how given certain circumstances and motivations, seemingly decent people can be drawn into the depths of darkness. The fictitious rural Mexican town of Carritza located 120 kilometres north of Acapulco in the Province of Guerrero, and the neighbouring Ejido Mapolombampo the indigenous village of the Núkul Tribe and the Tribe’s adjoining traditional lands are the main settings for this story where worlds collide – that of Mexico’s drug trade and traditional indigenous life.Read the complete review of The Equinox Convergence by Erik Orrantia at Indie Reviews. Erik Orrantia - Born in San Francisco in 1970, Erik Orrantia lived in the San Francisco Bay area until 1997. By that time, he had earned a Bachelor’s Degree in Psychology and a Master’s Degree in Counseling at California State University in Hayward. His original intention was to build a practice in psychotherapy.He then felt a calling to explore the world and entered an International Study Program in Mexico City where he earned a teaching credential. He currently works as a middle school teacher in San Ysidro, California, along the Mexican-American border. He was voted Teacher of the Year in 2008 for his school district.He has traveled extensively throughout Mexico. He now spends most of his time in Tijuana with his partner and dedicates his free time to writing.